Pennar supplies a variety of different load bearing components such as under body frames, side bars, door frames, etc. Our manufactured products comply with the stringent design and manufacturing standards and are approved by RDSO. Used for Overheard electrical installation, inspection & maintenance; equipped with a lifting & swiveling platform; earthing & measuring pantograph. 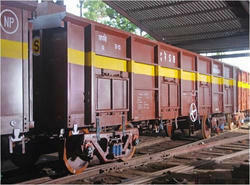 Salt Wagon prototype, specially manufactured for Indian Railways at the instance of the PMO. For Carrying Iron Ore from Mines to Steel Plants and Ports. Commodity discharge through Tipplers. TEXMACO has made significant thrust in overseas markets. Several Awards bear testimony to its successful achievements in National and International Projects financed by World Bank, ADB and other Multi-lateral Funding Agencies. Commercial Engineers & Body Builders Co. This bogie open wagon was designed at 22.9t axle load and 250mm longer than BOXNHS wagon. The wagon is manufactured by using stainless steel and cold rolled sections. Being a trustworthy company of this domain, we are engaged in offering Railroad Car to our customers. Our offered product is appreciated amongst customers for its easy installation and long service life. Railroad Car is manufactured using excellent grade of material under the strict guidance of professionals.